Update: The Fourth District granted a motion for clarification and released THIS opinion on March 30, 2011. It appears the clarification indicates the attorneys referred to the Florida Bar were not the appellate attorneys. The opinion was written by Judge Warner and Chief Judge Gross, Judge Stevenson, Judge Taylor, Judge May, Judge Damoorgian, Judge Ciklin, Judge Gerber, Judge Levine and Judge Conner concurred. Judge Hazouri was recused. Judge Polen filed a dissenting opinion. The dissenting opinion was written by Judge Farmer, who has since retired from the Court. Judge Polen filed the dissenting opinion as he agreed with what Judge Farmer had written. BNY Mellon commenced an action to foreclose a mortgage against the defendant. The mortgage attached to the complaint specified another entity, Silver State Financial Systems, as lender and still another, Mortgage Electronic Registration Systems, as mortgagee. The complaint alleged that BNY Mellon owned and held the note and mortgage by assignment, but failed to attach a copy of any document of assignment. At the same time, it alleged the original promissory note itself had been “lost, destroyed or stolen.” The complaint was silent as to whether the note had ever been negotiated and transferred to BNY Mellon in the manner provided by law. The defendant initially sought dismissal for failure to state a cause of action, arguing that in light of the claim of a lost instrument, the absence of an assignment of mortgage was a critical omission. BNY Mellon responded by amending the complaint only to attach a new unrecorded assignment, which happened to be dated just before the original pleading was filed. In response to the amended complaint, the appellant/defendant moved for sanctions and the appellee/plaintiff dismissed the complaint. Five months later, BNY Mellon refiled an identical action to foreclose the same mortgage. The new complaint no longer claimed the note was lost and attached a new assignment of mortgage dated after the voluntary dismissal. In the original, dismissed action, the defendant filed a motion under rule 1.540(b), seeking to strike the voluntary dismissal in the original action on the grounds of fraud o n the court and for a dismissal of the newly filed action as a consequent sanction, requesting an evidentiary hearing. The trial court denied the motion without an evidentiary hearing, essentially holding that, because the previous action had been voluntarily dismissed under rule 1.420, the court lacked jurisdiction and had no authority to consider any relief under rule 1.540(b). We affirm the trial court’s refusal to strike the notice of voluntary dismissal. Neither rule 1.540(b) nor the common law exceptions to that rule allow a defendant to set aside the plaintiff’s notice of voluntary dismissal where the plaintiff has not obtained any affirmative relief before dismissal. Here, we do not view it as an appropriate exercise of the inherent authority of the court to reopen a case voluntarily dismissed by the plaintiff simply to exercise that authority to dismiss it, albeit with prejudice. Only in those circumstances where the defendant has been seriously prejudiced, as noted in Romar International, should the court exercise its inherent authority to strike a notice of voluntary dismissal. The defendant in this case does not allege any prejudice to him as a result of the plaintiff’s voluntary dismissal of its first lawsuit. Indeed, he may have benefitted by forestalling the foreclosure. The appropriate procedure is to follow Rule 1.420. Upon the voluntary dismissal, Pino would be entitled to his costs and possibly his attorney’s fees. See Fleet Servs. Corp. v. Reise, 857 So. 2d 273 (Fla. 2d DCA 2003). The court can require payment as a precondition to the second suit. 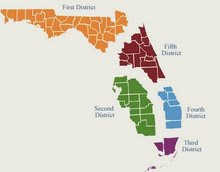 See Fla. R. Civ. P. 1.420(d). Moreover, a referral of the appellee’s attorney for a violation of the Code of Professional Responsibility for filing the complaint with the alleged false affidavit is in order. I wanted to add that appellate counsel for the appellee was not involved in the trial court and is not who the court is referring to the Florida Bar. The opinion was written by Judge Warner and Chief Judge Gross, Judge Stevenson, Judge Taylor, Judge May, Judge Damoorgian, Judge Ciklin, Judge Gerber, and Judge Levine concurred. Judge Polen filed a dissenting opinion. The dissenting opinion was written by Judge Farmer, who has since retired from the Court. Judge Polen filed the dissenting opinion as he agreed with what Judge Farmer had written. In Venetian Salami Co., the Florida Supreme Court set forth the procedure for determining whether personal jurisdiction over a foreign corporation is appropriate. This two-step inquiry requires a the trial court to first determine whether sufficient jurisdictional facts exist to bring the action within the ambit of Florida's long-arm statute (section 48.193), and then to determine whether the foreign corporation possesses sufficient “minimum contacts” with Florida to satisfy federal constitutional due process requirements. Venetian Salami Co., 554 So. 2d at 502. Ultimately, the court concluded "In short, we agree with RAI and RGP that insufficient jurisdictional facts exist to confer personal jurisdiction over them under Florida's long-arm statute. While this conclusion makes it unnecessary to address the constitutional prong of Venetian Salami Co., we nonetheless note that even if the undisputed facts fell within the ambit of section 48.193, RAI and RGP's conduct would still not be such that they should reasonably anticipate being haled into court in Florida." As reported by the ABA Journal, in THIS opinion, the Seventh Circuit summarily affirmed the trial Court's judgment and wrote simply to address the fact that the appellant's initial brief exceeded the 14,000 word limit by 4,000 words. This was done notwithstanding the fact that the appellant included a certificate in the initial brief stating the brief was less than 14,000 words. While the trial court's judgment was summarily affirmed on the merits, the court noted it could have dismissed based on the word count violation (and based upon the certification). In Henderson v. Elias (4D10-458 & 4D10-1135), the Fourth District reversed the trial court's order denying a motion to dismiss for lack of personal jurisdiction. The appellants filed a motion in the trial court seeking to dismiss for lack of personal jurisdiction and, among other things, to dismiss for inconvenient forum. Both the jurisdictional issue and the forum issue were appealed but only the jurisdictional issue warranted reversal. The original complaint [petition] included the bare jurisdictional allegation that "the court possessed jurisdiction over Stardale because of the court’s 'inherent jurisdiction to monitor the administration of the [e]state'.” The appellants filed a motion to dismiss which resulted in the appellee's filing an amended petition. In the amended petition, the personal representative alleged that the probate court had jurisdiction over Stardale pursuant to the court’s “inherent jurisdiction to monitor the administration of an estate, including the authority to issue injunctions freezing assets claimed to belong to a decedent’s estate.” In addition, the personal representative alleged that Stardale was “owned 50% by the [e]state and 50% by Henderson.” Stardale filed a motion to dismiss, claiming insufficient service of process. Henderson filed another motion to dismiss the amended petition on the grounds that Stardale was an indispensible party to any injunctive relief the court might grant. In the meantime, the estate personally served Stardale’s registered agent....Henderson’s counsel, who had also been Stardale’s counsel at the prior hearing, advised the probate court that he was appearing on behalf of Stardale on a limited basis to contest jurisdiction. The estate argued that the court had personal jurisdiction over Stardale because Stardale’s primary place of business was in Palm Beach County. Additionally, Stardale borrowed money from Elias and from Lydian Bank, and those obligations arose in Palm Beach County. Payment on these loans was also to be made in Palm Beach County....Stardale responded by arguing that, since it was a foreign corporation, the estate was required to plead jurisdictional allegations in its amended petition which were sufficient to establish personal jurisdiction over Stardale. Stardale went on to argue that the jurisdiction allegations in the amended petition were insufficient to show that Stardale’s conduct fell within the scope of Florida’s long-arm statute, section 48.193(1), Florida Statutes (2009), or to show that Stardale had sufficient minimum contacts with Florida to satisfy constitutional due process requirements. Initially, it is the plaintiff's burden to plead sufficient allegations to establish personal jurisdiction over a non-resident defendant "by pleading the basis for service in the language of the statute without pleading the supporting facts." In response, the defendant can file a motion to dismiss which, by itself, "does nothing more than raise the legal sufficiency of the pleadings." To contest the actual allegations, the defendant "must file affidavits in support of his position."... "The burden is then placed upon the plaintiff to prove by affidavit the basis upon which jurisdiction may be obtained." made no allegations of conduct by Stardale which would subject the corporation to the jurisdiction of a Florida court under section 48.193(1)....The petition contains no allegations that Stardale is Henderson’s alter ego....Likewise, no allegations of a principal-agent relationship were found in the petition....Because the allegations in the petition are insufficient, the trial court should have dismissed the amended petition as to Stardale without prejudice.